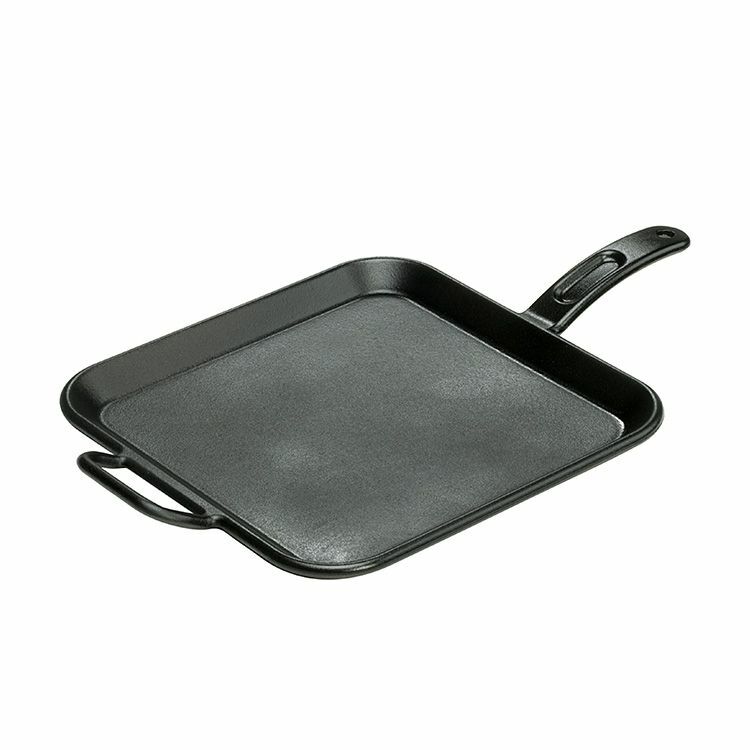 12 inch Pro-Logic Square Griddle Since 1896, the Lodge family has been casting premium iron cookware at our Tennessee foundry. As the sole American manufacturer of cast iron cookware, we are proud to carry on the legacy started by our great grandfather Joseph Lodge. We don`t just make products; we make heirlooms that bring people together for generations. At home in the backyard, the backwoods, or the ballgame. Brutally tough for decades of cooking. 12 inch Pro-Logic Square Griddle is rated 5.0 out of 5 by 17. Rated 5 out of 5 by Tim from Very heavy duty. Much heavier than the 12” round, thicker... Very heavy duty. Much heavier than the 12” round, thicker metal and two handles. Get the Lodge silicon handles to move it or something similar. Can cook 4 pieces of French Toast at once with room to spare. Seasoning is likely GMO Canola. Wash and redo. Made in the USA! Rated 5 out of 5 by Santa from Great cast iron ware. Large but what you need for Rubens and french toast. Delivers even heat an... Great cast iron ware. Large but what you need for Rubens and french toast. Delivers even heat and the wife is very happy with it and that's all you need to know. Rated 5 out of 5 by willie from love the griddle use it every day mostly for breakfast... love the griddle use it every day mostly for breakfast and heating tortillas for every meal.I used to buy teflon type before and had to replaced them every year or so but this one will last a few lifetimes and will be passed on to my kids. Rated 5 out of 5 by Jimtheelder from I was looking for a flat cast iron skillet larger than the 10" round I already have. This skillet... I was looking for a flat cast iron skillet larger than the 10" round I already have. This skillet just fits on my cooktop, and while it does take longer to heat up, works very well on an 8" electric burner. It came pre-seasoned so nothing stuck when I used it the first time. Great for omelets or anything that needs to spread out over a large area. Rated 5 out of 5 by Harley from Great product and made in the USA. Great product and made in the USA. Rated 5 out of 5 by Rufus from Lodge cast iron griddle Great product. I recommend this griddle. I have used it camping and in our home for cooking breakfast and grilled sandwiches. It is a must have for any camping trip or every day use in the kitchen.